A Slips, Trips and Falls Training Course from just £4.99. An online health and safety course teaching how to identify risks and prevent slips and trips at the workplace. This training certificate is a national qualification, recognised by local authorities and corporate employers throughout the UK. On successful completion, your certificate is valid for three years. As well as your certificate of achievement, why not download our free Slips, Trips and Falls Poster HERE to use and display at your workplace? 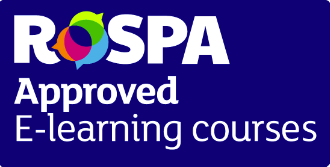 Why choose our award winning on line health and safety courses for your training? Because this training course looks at slips, trips and falls in the workplace, and has several walk-through scenarios where we look at causes and preventative measures. Because it’s designed to show staff how common slips, trips and falls are and accidents such as a scald from hot coffee might have been a direct result of a slip or trip but may not have been recorded as one. Because All our training courses are created by health and safety professionals that are both PTLLS, and NEBOSH qualified. Because it conforms to UK and EU legal requirements. Because of the ease of use and intuitive learning platform. Because on completion you get an instant digital training certificate to download and print. Here's some more great news about our training course. The training course usually takes about an hour, depending on your learning speed. On completion of the training course, each successful candidate receives a Certificate Of Training, avilable as an instant download. Is this course for you?. This course is designed to help reduce the amount of major injuries that are a result of a slip, trip or fall. The figure currently stands at over 30%. It shows people how to spot and assess risks and how to act upon them. Teaching control measures that will help prevent dangerous occurrences. Showing the importance of clear routes that are not obstructed with cables, delivery packages and other objects. Showing the importance of maintenance for floorcoverings, steps and artificial lighting. Slips, trips and falls account for a third of all reported major injuries each year. This course is primarily concerned with preventing these injuries by educating course candidates in common causes and preventative measures. To show how to assess risk and report safety concerns to the right person. To give relevant injury statistics so that candidates can learn the importance of slip and trip avoidance. To teach staff the importance of relevant and key elements of the Health and Safety at Work Act, The Management of Health and Safety at Work Regulations. To teach staff the difference between an environmental hazard such as frayed carpet, and a personal hazard, such as running down stairs. To let staff, know what their responsibilities are and the benefits achieved if all members of staff commit to an employer’s health and safety objectives. The pass rate for each module is 70% and you have to pass each module to move onto the next. Once you have completed the course you will have instant access to your training certificate which can be downloaded and printed or emailed. Your national training certificate is valid for three years.